Doors are open to the new North Terminal at the 95th/Dan Ryan Red Line station, in addition to the new South Terminal, already open! Mayor Emanuel joined us in celebrating the opening of the second of two brand new bus and rail terminal facilities at 95th Street on January 4, 2019. The opening of the North Terminal is a major milestone in a $280 million project that is building a state-of-the-art 95th/Dan Ryan station on the city’s South Side and has already created more than 760 construction jobs. The 95th/Dan Ryan station is one of our busiest terminals, with 24-hour Red Line service and over 20,000 daily bus and rail passengers. 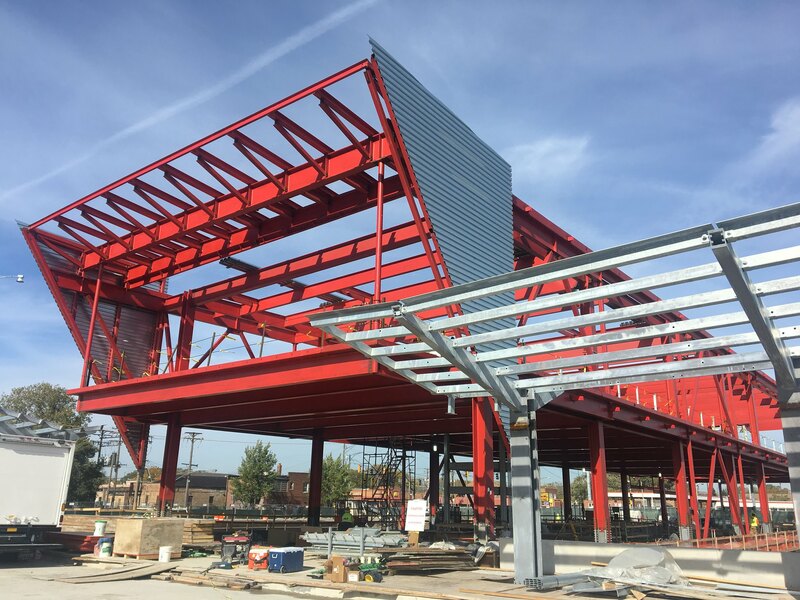 When the North Terminal is completed later this year, 95th/Dan Ryan will be a signature station on Chicago’s South Side that will provide customers with a modern design and amenities to improve the overall transit experience. Both terminals will feature two new, unique public art displays by internationally recognized artist and Chicago native Theaster Gates. The South Terminal will display a pair of large tapestries made from colorful strips of decommissioned fire hoses that are sewn together. The North Terminal will include a first-of-its-kind radio station and DJ booth that will broadcast over the 95th Street station’s PA system. Construction on additional improvements continues on certain parts of the station and the art is expected to be unveiled later this year, upon completion of the entire station project work. 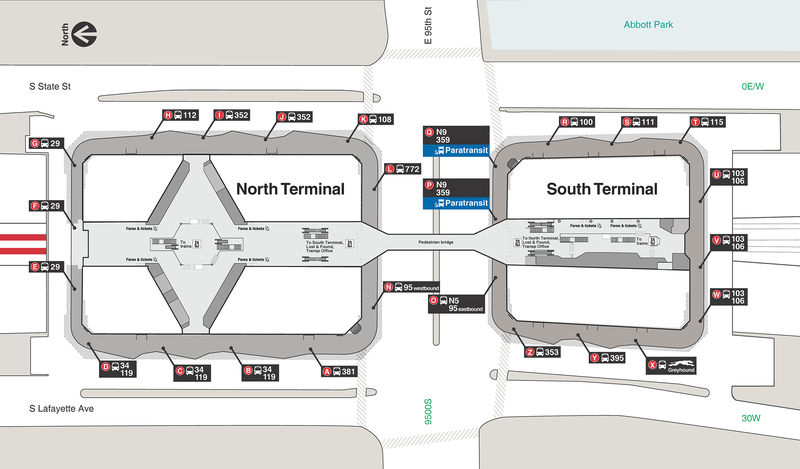 Following the opening of the North Terminal and its additional bus bays, bus boarding locations changed for most routes and new entry and exiting locations for Red Line trains will be available at the 95th/Dan Ryan station, following the opening of the new North Terminal concourse and an elevated pedestrian bridge over 95th Street, connecting the North and South terminals. A new train platform and boarding area under the new North Terminal building offers the added convenience of boarding Red Line trains from both terminals and allows passengers to reach trains from either the north or south sides of 95th Street. Stairs, escalators and an elevator connect the North Terminal concourse to the train platform. Bus boarding locations have changed at 95th/Dan Ryan, following completion of the north bus bridge in the North Terminal and opening of bus stops E, F and G.
Originally built in 1969, this station is now one of our busiest, with 24-hour Red Line service and over 1,000 CTA and Pace bus trips on a typical weekday.There are roughly 300,000 people who live within walking distance of the CTA bus routes serving the 95th/Dan Ryan Terminal. We're also taking advantage of the ongoing terminal construction to make improvements to the complex track and interlocking just south of the station leading into the 98th Street Yard. Items to be replaced include a complex interlocking, signal and traction power cabling and duct banks, ballast and other related materials. Doing this track work simultaneous with the station work will limit the need for any service disruptions after the new station is built. This work will help improve the movement of train traffic in and out of the 98th yard and through the 95th Terminal, which services the Red Line—our busiest line. It’s only fitting that one of the largest station reconstruction projects in agency history also features the largest public art installation in our collection. To accomplish this task, we’ve tapped internationally recognized, Chicago-based artist Theaster Gates. Artist Theaster Gates' conceptual rendering of "an extended song of our people (AESOP)" -- the new art installation for the north terminal building at the 95th Street Red Line station. Artist Theaster Gates' conceptual rendering of "america, america" – the new public art planned for the south terminal building at the 95th Street Red Line station.